Portrait of Catherine the Great (r. 1762-1796) by Fedor Rokotov (1735-1808) based on an earlier portrait by Alexander Roslin (1718-1793). 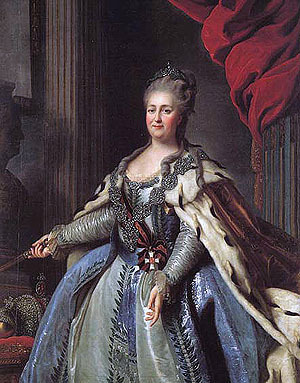 Pretty amazing that a stout, non-Russian princess from an obscure German petty principality (Sophie Augusta Fredericka of Anhalt-Zerbst) went on to become Catherine the Great of Russia. Talk about upward mobility! Read the textbook chapters 21, 22, 23 and 24. Check the remarks by Professor Blois and Professor Evans on Catherine the Great. Read chapter 17 and chapter 18 from Mary Platt Parmele (1843-1911) A Short History of Russia (1907, 4th edition). These are short chapters, and this is optional reading. For 50 points maximum extra credit, read Aleksandr Radishchev (1749-1802), Journey from St. Petersburg to Moscow (1790) and write a one-page paper explaining why this novel was considered dangerous by Catherine the Great. For 50 points maximum extra credit, read Isabel de Madariaga, Russia in the Age of Catherine the Great (1981), an excellent scholarly biography, and write a one-page paper that details the author's interpretations of Catherine's reign. For 25 points maximum extra credit, read The Instructions of Catherine II to the Legislative Commission of 1767 (The "Nakaz") and write a paragraph that answers the question, What was the rationale in the Nakaz justifying the autocracy? The link will probably not work, but I have a copy on this website. For 25 points maximum extra credit, read Catherine's Proclamation upon ascending the throne, her letter to D'Alembert and the comments by the English ambassador and then write a paragraph that assesses the character of Catherine the Great as an "enlightened" ruler of Russia.